Mix the ingredients for puris with water to make a not very soft dough. Roll them into rotis and using some lid of small round steel box, press the lid on the rotis to get small round puris. Using a knife, make small holes in these puris so that they remain flat when fried. Heat oil and deep fry them till golden brown. For preparing sev, mix the ingredients with water to get a soft dough. Put this in the machine with small holes and press directly to make sev in hot oil. Remove from oil when the hissing sound stops and the sev changes colour. 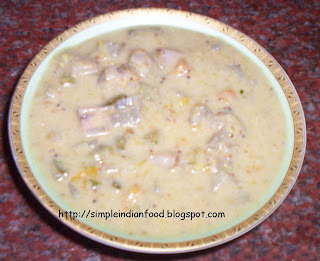 See here for the meetha chutney recipe. Ingredients remain the same. You just have to heat them to get the desired thickness. Green chutney is made by grinding coriander leaves, green chilly and salt. Place the puris on the plate. Cut the potatoes into thin slices and place one each on the puris. Sprinkle some salt and chat masala powder on the potatoes. Add onions, Sweet chutney, curd and green chutney. 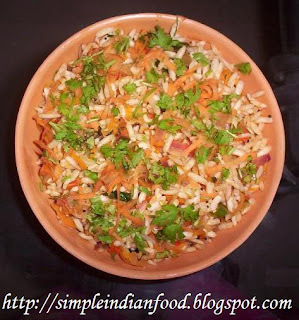 Finally add lots of crushed sev on it and garnish with finely chopped coriander leaves and grated carrot. Sev puri as tasty as you get in chat shops is ready to eat. To make task easier, you could even opt to purchase readymade nylon sev from the market. Also the puris neednt be made just before serving. You can make them well in advance and store them in an air tight container. Cut the potatoes into cubes and add the turmeric powder, red chilli powder, salt and asafoetida. You could even add some garam masala powder to it if desired. Mix well and deep fry the potatoes till golden brown. You can have it with rice, chapatis or even plain...they are really tasty. Roast the groundnuts without oil till it changes colour. Grind it along with the coconut, salt, red chillies and asafoetida. Heat oil and add the mustard seeds.When it splutters, add it to the chutney. Serve as a side dish for dosa, idli varieties. Soak the rice, dals and red chillies for atleast 2 hours. 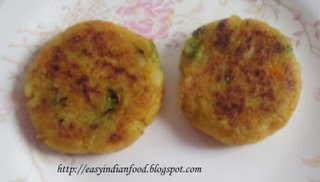 Grind it along with salt and asafoetida to a coarse batter. Add finely chopped curry leaves and mix well. Heat the dosa tava and use the batter to make adai. Add some oil and cook on both sides till brown spots appear. Serve hot with Avial, chutney and jaggery. You can even add some finely chopped onions to the batter. Dry roast the redgram dal, pepper and red chillies and grind along with salt to a coarse powder. This powder can be stored in an air-tight container for a month. Dry roast these ingredients and grind them along with salt to a coarse powder. You can store in an airtight container for almost 15 days. Roast the dals and red chillies without oil till it turns golden brown. Fry the scraped coconut also seperately with ghee and grind all the ingredients to a coarse powder. Store it in an airtight container for a maximum period of one week. Alternatively you can even add this to any of the dry vegetables to give more tastes and even to sundals. Grind all ingredients well except coconut and fried dal. Once you get a coarse powder, add these two ingredients as well and grind again to a smooth powder. Serve with little oil or with little curd. It goes very well with dosas and idli. Sending this also to Asha's RCI Karnataka event. I had the opportunity to eat this benne dose at davangere few months back. Now sharing it with you. Mash the boiled potatoes and add salt, chopped onions and mix well in medium flame for five minutes. This is how the typical benne dose sabzi is made. Take a big spoon of dosa batter and spread it on hot tava. Instead of the normal dosa where we add oil, spread out the unsalted butter on it. 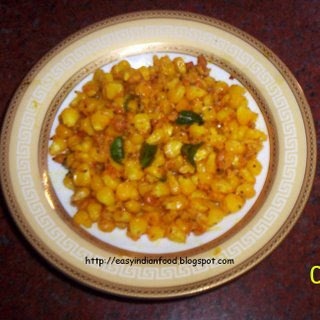 Cook on both sides and serve with potatoes, butter, sambhar and chutneys. Soak the blackgram dal for half an hour and grind it to a smooth batter with less water. Add water to the idli rava and clean it. Add it to the blackgram dal paste and grind it along with it to get a smooth batter. Add salt and mix well. Transfer batter to a bigger vessel and allow it to ferment for atleast 8 to 10 hours. Refrigerate after fermentation and best used before 5 days. Soak the rice and dal seperately for atleast 2 hours. Grind the blackgram dal first to a smooth paste and then add both the rice (without rice). Grind it to a smooth batter and add salt. Soak the rice (mix of raw and boiled rice) and the dals (mix of blackgram dal, redgram dal and fenugreek seeds) seperately with adequate water for atleast 2 hours. Grind the dals first to get a smooth paste and then add the rice (without water). Grind with minimum water possible to get a smooth batter. Add salt and transfer the batter to a bigger vessel. Allow it to ferment for atleast 8 to 10 hours. This batter must be refrigerated after fermentation and is best used within 3 to 4 days. Cook the peeled corn in some water. In a separate vessel, heat the oil, add mustard seeds, bengalgram dal, blackgram dal and let it splutter. Add curry leaves and then the cooked corn. Add salt and the masala paste. Serve hot...A healthy snack for evenings. Mash the boiled potatoes and mix with all other ingredients except oil and bread. Wet the bread with water, squeeze out all the water and add to the mix of vegetables dough. Now make medium size balls and flatten them like vada. Now you have two options- The first one is to deep fry the cutlets by rolling them in bread crumbs . But this consumes more oil. The second method and the way I did these is- Just place them on the chapati tava, add a few drops of oil and when it is golden brown, turn and cook the other side as well. Serve Hot with sweet chutneyor sauce. Also an ideal way to utilise leftover vegetables. Heat water in a pan and side by side cut the cauliflower into small florets. Put the florets in the hot water and let it stay for abt 3-5 mins. Roughly chop the onions, tomatoes and ginger and grind to a smooth paste in the mixie. Heat a pan, add some oil and the jeera, once jeera splutters add asafotedia and the ground paste. Cook the paste till the raw smell disappers. You will notice that the colour of the paste changes to bright red on being cooked. 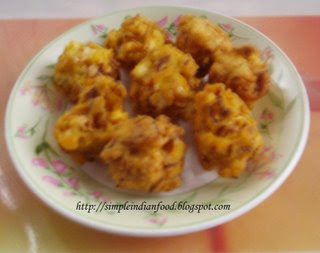 Meanwhile, cook the cauliflower florets in little water or microwave the florets with salt. Now add dhania powder, garam masala, red chilli powder, tumeric powder and kasuri methi to the boiling paste and mix well. Once the aroma is smelt, add salt to taste (salt for the gravy only). 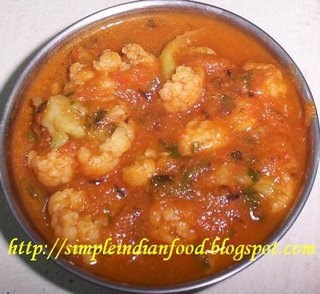 Add the cauliflower florets now and ensure that the masala is well coated on the cauliflower. Water can be added to dilute the gravy as per individual choice. Let the gravy come to a boil, then serve the curry after garnishing with chopped coriander leaves. This curry takes very less time for preparation. Mix all the ingredients well and add little water to form a dough. Make small balls of it and deep fry in hot oil. Strain out excess oil on a tissue paper. Sending this to Hima's WYF-Snacks Event. First cut all the vegetables into small and equal pieces and boil them. Roast the bengalgram dal and grind it along with other masala ingredients to get a paste. Add it to the boiled vegetables. Add asafoetida and salt to it. Before serving, add sour curds and serve with rice or chapatis. I had some rice leftover and was bored of making the usual lemon rice or fried rice from it. So, I decided to try out a new recipe. Parathas make a good breakfast. Take the leftover rice in a bowl and mash it thoroughly, if need be can use a blender too. Add the other ingredients except oil to this mashed rice. The dough will be a bit sticky so apply little oil on your hands to make round balls of the dough and roll into small parathas. I found patting with my hands easy to make small parathas. Dip parathas in flour to aid in easy rolling of the parathas. Heat a tawa and put on the paratha. Add little bit oil around the sides of the paratha. Cook till brown spots appear on both sides of the paratha. 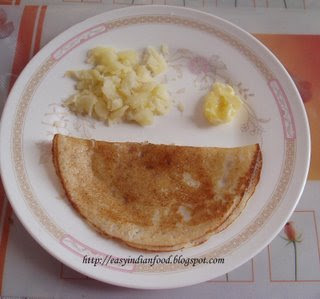 Serve the hot parathas with curd/raitha/pickle. One morning, I opened the fridge to see half onion, one tomato, half green capsicum and a small piece of carrot welcoming me. I prepared an easy sandwich spread which can double up as a raitha too. Take curd in a bowl and beat it finely to ensure that no lumps remain. Finely chop the onion, tomato and capsicum and grate the carrot. Add the cut vegetables alongwith salt and chilli powder to get a delicious sandwich spread. The spread needs to be put on the bread slice just before eating else the curd will make the bread soggy. Also, the water left out by the onions and tomatoes will dilute the curds after some time, so ensure that the spread is eaten immediately after being made. Leftover spread can also be used as a mixed vegetable raitha. I had made fried rice the earlier day and realised that I have cooked a bit more vegetables as compared to the rice. The next morning, I added Bengal Gram flour and little bit cornflour to the vegetables to make pakodas. A good item for a leisurely Sunday breakfast. All the three recipes are my entries to Nandita's WBB-15 event. Raw Tomato Dal is one of my favourite dishes. This is an excellent side dish for chapatis. Needless to say, this dal goes well with rice too. Pressure cook the moong dal. Take about 2-3 drops of oil and roast the masala ingredients (except coconut). Grind to a fine paste in the mixie after adding coconut and sufficient water. Heat a spoon of oil in a kadai and add mustard seeds, curry leaves and asafotedia. Cut each raw tomato into 8 equal pieces and add in the kadai. Please note that we are cutting big pieces since tomatoes lose water and shrink on being cooked. Add salt to the tomatoes and let them get cooked. Finally, add in the cooked moong dal, salt and the ground paste and let the dal come to a boil. The salt being added here is for the moong dal since we have already cooked the tomatoes with salt. Depending on your chosen consistency, water can be added if the dal is a bit thick. Garnish with chopped coriander leaves. 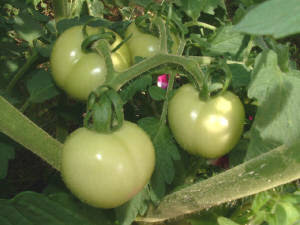 1.Select only green tomatoes which are a bit hard. 2.Make this dish within 1-2 days of buying the green tomatoes, else the tomatoes start ripening and the taste of the dish will change. Banana Stem Raitha is my entry to JFI:Banana. This raitha is very easy to make and nutritious too. Take curd in a serving bowl and beat it well so that no lumps remain. Add some water if the curd is really thick. Remove the outer layer of the Banana stem and then cut the stem in round slices. You will notice fibre sticking to the slices, gently take the fibre off. If this is done, cutting into smaller pieces becomes very easy. Using this method, cut the banana stem into small pieces and immediately put the pieces in the curd so that it maintains its colour. If left open after cutting, banana stem pieces will turn brownish in a short span just like apples. Next add salt as per taste. Heat one spoon oil, when the oil is hot, add mustard seeds. Once the mustard seeds splutter, add curry leaves (cut into small pieces) and then add asafotedia. Pour this over the curds and mix well. Delicious raitha is ready. Now take a small ball of the wheat flour dough, roll it into chapatis with more dough in the centre and thinner chapati outside. Place the ball of vegetables mix in the centre and cover it well from all sides. Cook them on a tava with some oil. When both sides are cooked well with brown spots on it, transfer to the serving plate and add a drop of ghee to it. Also, I made sundal and semiya payasam. Puffed Rice (Mamra or pori) is known as Mandakki in Karnataka. Kara-Mandakki is often given as a snack item in Kannada households. 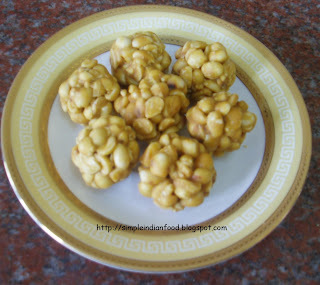 I first ate Mandakki Usili as a kid when my grandma made it. Since then, the dish is one of my top favourites. Mandakki Usili is easy to make and a break from the usual rava and vermicelli upma. Take the mandakki in a big bowl and pour water over it. You will hear hissing sounds, gently try to mix the mandakki with the water. Then pour off the water and collect the mandakki in another bowl. Repeat this couple of times till the water comes out clear indicating that the mandakki is clean. You will notice that the mandakki reduces in size and absorbs water as seen below. Squeeze out excess water from the mandakki. Take a pan and heat a spoon of oil in it. Add mustard seeds and allow it to splutter, then add green chillies and curry leaves and asafotedia. Add the chopped onions and fry till cooked, then add in the tomatoes and cook for some time. Finally add the grated carrot and salt to suit the vegetables. Please note that the mandakki already contains some salt, so adjust the proportion of salt to be added accordingly. If you prefer more spicy mandakki usili, little bit chilli powder can also be added. When the veggies are cooked, they will look like this. Finally add in the mandakki to the veggies and mix gently. Now taste the same and add salt if need be. A minute later, delicious mandakki usili is ready to serve. Garnish with grated carrot and coriander leaves. 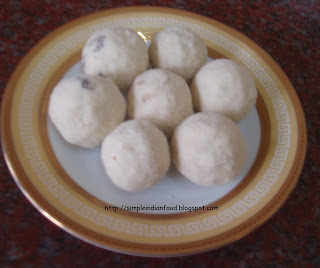 This recipe is our entry to Asha’s RCI Karnataka event. Hope readers trying out this recipe will surely like it. When we overeat at parties/weddings or sometimes even at home resulting in a heavy/bloated tummy, Jeera Kashayam (Kaada) is the perfect solution. This kashayam is very easy to make, requires very less ingredients and most of all offers good relief. The kashayam can be taken on a daily basis also since it aids in easy digestion. Roast the jeera in a saucepan on slow heat. You will hear crackling sounds, that is normal. Ensure that all the contents get roasted evenly. The seeds must not fully blacken and not be raw at the same time. The aroma given out will aid in recognising that the jeera is roasted. At this stage, add about 1.5 glasses of water and allow it to come to a boil. Crush jaggery with your fingers/cut into small pieces with a knife and add it to the boiling water. Use a spoon to mix the contents. Now, add about a quarter cup of milk (depending on your taste). Some people prefer to have the kashayam without milk. Let the milk come to a boil, then put off the gas and filter the kashayam. All jeera seeds will remain in the filter. The resultant kashayam is pictured below. P.S: The colour of the kashayam may change depending on the colour of jaggery used. Sugar can also be substituted for jaggery. The main purpose of adding jaggery is for flavour. Aunty had come home with a box full of these burfis. The recipe is quite simple and the chocolate flavour adds a dash to the burfi. In a kadai, melt the sugar with sufficient water to get a one-string consistency syrup. Then add the coconut scrapings and stir slowly in one direction. Add the elaichi powder. Mix well with the syrup, add cocoa powder and nuts. Stir till the mixture starts leaving the sides of the vessel and then empty the contents onto a plate smeared with ghee. Allow the mixture to cool a bit and then cut into desired shapes. P.S: Another variation in this sweet is by using mango pulp and adding it alongwith the coconut scrapings to the sugar syrup. Soak the sago in water, it should be just wet. Keep mixing it every 30 minutes and keep it wet. The sago should become very soft in about 2 to 3 hours. Roast the groundnuts and grind it coarsely with 1 green chilly. In a fry pan, heat the oil, add cumin seeds and the other green chilly. Now add the sago and the groundnut powder. Add salt, mix well. I came across Hima's Blog Snackorama, where she has announced the theme of Whats Your Favourite Snack for September. One of the all time favourite snacks is onion pakodas/pakoras/fritters. This dish is simple to make and is well-loved all over India. Onion Pakodas are my contribution to the above event. Finely chop onions lengthwise. Chop green chillies and add to the flours. Add salt, chilli powder, curry leaves and coriander leaves and onions and mix well. Heat oil for frying and add a spoon of hot oil to the flour mix. Prepare a bit powdery dough from the flour mix using little water. When the oil is hot, take a big ball of dough and drop in small pieces in the oil. Fry till reddish brown colour. 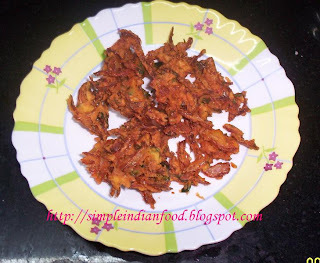 Put the pakodas on kitchen paper to drain excess oil and then serve the pakodas with chutney. Boil 3 cups of water and add the rice sevai to it. Allow it to cook for five minutes. Remove and transfer to a strainer and allow the water to drain completely. Heat oil, add mustard seeds, bengalgram dal and blackgram dal. When it starts spluttering, add the green chillies and turmeric powder and finally the cooked rice sevai. (ensure that it is completely dry without any water). Add salt, lemon juice and mix well. Cook for medium flame for 2 minutes. Garnish with roasted cashews and finely chopped coriander leaves. 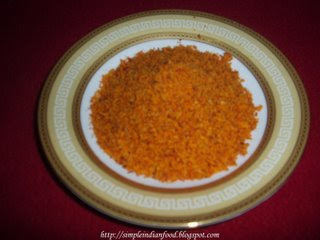 You can mix dry puliyogare powder to the cooked rice sevai and omit all other ingredients. Also, instead of lemon juice and turmeric powder, you can add some scrapped fresh coconut to the rice sevai. Heat oil and add cumin seeds. Now add the ladies finger cut into long pieces and mix well. Allow it to cook on medium flame for five minutes. When cooked, add turmeric powder, red chilli powder, garam masala, salt, tomato puree, cumin seeds powder and coriander seeds powder. Mix well and bring it to a boil. Pressure cook the rice and greengram dal together with required quantity of water (water should be 3 to 4 times the quantity of rice). In a small kadai, heat the ghee, add the cashews. When it turns golden brown, remove the cashews and add the cumin seeds, pepper and curry leaves to the ghee. Cut the carrot and beans into long pieces. Clean the rice and dal and pressure cook it. Soak the tamarind in some water and extract the juice. Roast the masala ingredients and grind it to a paste. Heat oil, add mustard seeds, bengalgram dal, blackgram dal. When it starts spluttering, add the curry leaves, groundnuts, turmeric powder and finally the extracted tamarind juice. Add the masala paste, salt, vegetables and jaggery. Let it cook for some time. Finally add the cooked rice and dal and mix well. Bring it to a boil. Garnish with coriander leaves and some ghee. Serve hot. Sending it over to Shama's First cooked food event. Wash both the dals. Add the tomato and water and cook it well. When cooked, add turmeric powder, red chilli powder, salt, grated ginger and green chillies. Mix well and cook on medium flame for five minutes. Heat the ghee in a small pan and add the cumin seeds. Add this to the dal. A simple and tasty dal is ready. It can be served with chapatis, dosas as well as rice. During seasons for ginger when it is available at cheaper price, purchase them in large quanitities, clean them well under running water, grate them and dry well under sun. You can store it for long time and use in your everyday cooking. Its healthy too. Remove the skin of raw mango, grate it and dry well under sun. Crush it and store it for almost a year. While making rasam, boil the tomato seperately, remove the skin and mash well with hands. Also extract the juice for tamarind and mash the dal well while making rasam. It turns out to be very tasty and also you can use it till the last drop. Cover the vessel with a plate while mustard seeds splutter.It will not come out of the vesseland spread all over. Roast the cashews and raisins in ghee. Melt the ghee and mix all the ingredients well. Form balls of the required size. If it breaks, you could add some more ghee to it to make balls. Roast the ground nuts and remove the skin. Add some water to the grated jaggery and heat it till it gets thick. To check if it is of the right consistency, put a drop of it in some water and try to form a ball of it. If a soft ball turns up, it implies the syrup is of the right consistency. Immediately take out from the fire and added the roasted groundnuts along with elaichi powder. Blend it properly and make balls of it while it is warm.